The world is changing. The world of web design and development is changing too. You’ve got to know about the challenges at stake in the CMS market and latest trends in the website building industry. If you want to stay at the top, read this article to understand why the job of a web developer is bound to evolve. #1 Stop spending time fixing problems and technical issues ! As a web professional, you’ve probably worked over the past few years - and maybe still are - with mainstream conventional CMS such as WordPress, Drupal or Joomla. You’ve developed complex « tailor-made » CMS-based platforms along with PHP framework-based solutions. You cannot disagree about the fact that you certainly spent too many hours correcting errors, struggling trying to identify the roots of a server breakdown or web hosting related issue. Undoubtedly, you’ve also had to deal with changes incorrectly made by your clients that needed some revision. What we call traditional CMS platforms built their success on the community, themes and plugins. They used to be the “must” for building websites. If your goal is to stand out of the crowd of web developers, it means that you have to put in much effort to have an excellent command of CMS tools. Because of the learning curve, you have to do and undo, code and de-code, test and experiment many times before you become a respected and trusted professional. You know that for a fact. It is a real investment of your time and resources. #3 Because time is money, how can you be more efficient and focused? Today, the emergence of Cloud CMS radically changes the rules of the game. You probably have to build dozens of site per day, per week. Can you afford to be stuck while you need to make business ? Creating web functionality and monitoring back end support can be made nice and easy. These tasks don’t necessarily mean resolving bugs, keeping websites updated, customizing designs or installing plugins. Your time is valuable. You cannot waste it. Hosting and maintenance issues can be left to someone else. You need to focus on high added value activities. Offering flexibility, agility and autonomy -in one word freedom-, Cloud CMS can offer attractive alternatives for small websites, e-commerce websites, online shops and blogs. Thanks to advanced website functionality, building a website has become simple. First of all, let me remind you that Cloud CMS are online management systems that are located on the web. By definition, they don’t have to be installed to a local computer. Software can be then accessed through web browser from any computer with internet connectivity. What does this imply? It means you don’t have to use a single line of coding to create a brand new website. Second, you don’t need any database nor server hosting. Third, you are not compelled to purchase any software applications and additional components. Fourth, you can skip plugins for product updates and upgrades. If not, website security can be at risk. Let’s be honest. The major drawback of classic CMS is the difficulty to secure websites. How many times have you been faced with website hacking ? You probably had to come up with smart measures in order to prevent phishing, spyware, malware and viruses. As you already may know, the reasons for this weakness lie in the use of plugins, platforms’ collaborative nature and need for updates. Number of infected websites built with Wordpress, Drupal or Joomla is impressive. Cloud CMS usually offer bulletproof multilayers security, data storage in multiple locations and fast content delivery network all around the world. Needless to say, from the standpoint of a web professional, coding means having control over the system. You love expressing your creativity by customizing and developing applications, components, modules and other extensions. You would feel crippled and restricted with Cloud CMS as they typically don’t give you access to the HTML source code. But don’t worry ! You can still deploy your talents elsewhere with a Cloud CMS. Among innovative Cloud CMS, some enable you to have direct code access and ensure connection to your own backend server. # 7 Not sure which CMS to choose from ? Even though all Cloud CMS market players share common features in their offer, some stand out. Most popular website makers such as Wix, Weebly, Jimdo, Squarespace, Dudamobile or Webflow, claim they are the best. Some even boast unlimited memory space, ease of use, ergonomy and creativity. Other platforms brag about how they invented the latest design trends. 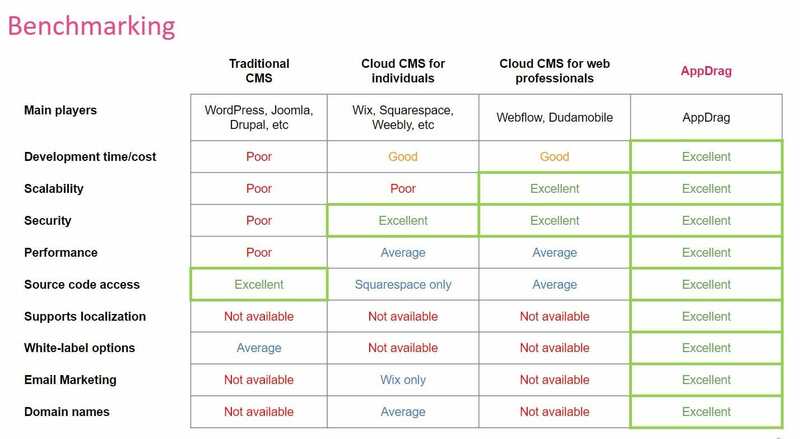 Here is an objective attempt to compare traditional CMS and Cloud CMS. This synthesis results from 4 benchmarks based on converging sets of criteria (Netinup, CypressNorth, Pulse, Simplon). #8 Not sure which Cloud CMS to choose from ? It’s all about choosing to be leaders or followers… If you want to stay at the top of your game, you’d better opt for the best tools while upgrading your skills. Let’s say you want to go ahead with a Cloud CMS. Not surprisingly, website builders with cloud hosting do not perform equally. Here is a quick comparison of main attributes of BtoB market players, Dudamobile and Webflow respectively launched in 2009 and 2013, and of the latest entrant in the market, AppDrag. First thing that might be of interest to you is « Do i have access to source code? ». The answer is « yes » if you use AppDrag or Webflow. With Dudamobile, it is only partial. Second question you must have on your mind is about the purchase / transfer of domains. Just very recently, AppDrag has been offering 458 useful extensions of domains versus none for the other 2 website builders. What can you say? Because the world is global, products and services need to be visible at international level. Language barriers can be broken by expanding to a multiple language website in one click. 105 languagues are currently available on AppDrag knowing that Webflow has no more than one and Dudamobile is almost out of the game with partial translation. What about the server response speed of pages served by AppDrag? Well, it is much faster than with an average tool. As a result, expect Google rankings through SEO to be improved in a significant manner. In today’s world of communications, a blog and e-ecommerce are kind of a “must”. Believe it or not, Webflow does not offer these features while Dudamobile requires a third party plugin. Guess what? On AppDrag, you can set up a cool blog and start selling online as soon as your site is up and running. We leave it to you to make your own conclusions. If you are already convinced or just curious, try out AppDrag now. Your comments and remarks would be more than welcome.